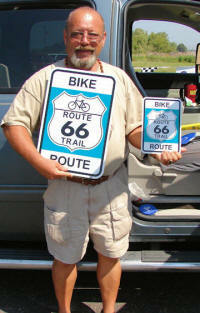 [August 17, 2009] Phil Mahler was pleased on Thursday to be holding the first Route 66 bike trail signs for Logan County. 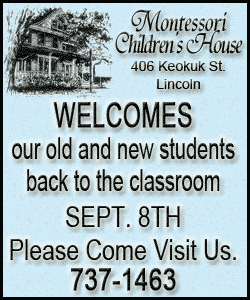 They had just arrived and were just in time, as one is to be placed at the Best Western Lincoln Inn on the city’s southwest side. The newly renovated motel is situated on the historic Route 66 and will make a great overnight stopping point for bicyclists traveling the Route 66 bicycle path. Plans that would establish the Route 66 trail through McLean County, Logan County's northern neighbor, are near completion, but Mahler noted that Logan was the first county to get the signs and didn’t want to waste any time getting them up. To Logan County's south, a stretch of the route in Sangamon County has been established with signage from Williamsville to Sherman. For many years several individuals have been committed to getting a bike trail established for Logan County. For the last three years, Mahler, John Sutton and Dale Bassi have diligently attended Route 66 bike trail meetings with state officials. Mahler said he has received 40 of the larger signs and another 20 of the smaller ones that will be used to denote the trail.